Are you getting the best out of your referencing software? Ellie Harries tackles Mendeley, Zotero and EndNote in a browse at the choices available for those who find themselves stuck in a referencing rut. Referencing is an essential feature of all academic research and rapid technological advances have contributed to the proliferation of programmes which can help researchers systematically manage their references. Referencing software allows researchers to build up personal libraries of articles, notes and citations and some tools even allow you to share papers and notes with colleagues. While all this is great, there so many options available that it can be hard to know where to begin. To help you make the right choice, this blog provides a short overview of three key reference management tools out there. Mendeley is an advanced research management tool which is favoured by some for its use of social networking features. Academics can share resources with colleagues through group libraries or upload a profile and find researchers with similar interests. As well as a desktop application, Mendeley stores academic libraries online, allowing researchers to access their papers and notes from any location. The desktop application contains powerful search functionality and lets researchers keep their citations, papers and references in one organised place on their hard-drive. Getting set-up on Mendeley is pretty straightforward: It only takes a few clicks to upload data and papers and the programme scans documents for metadata and automatically indexes key information like the name of the author and title of the article. It is also possible to import information held in other reference management tools, like Endnote and Zotero. Each user is allowed up to 1GB storage for a free account and Apple fans will find their iPhone and iPad apps very user-friendly. Zotero is an add-in that works in the Firefox web-browser. It allows you to collect, organise and cite research sources. At the most basic level, Zotero is a citation manager, and citations can be collected and stored as you roam the internet. Like Mendeley, Zotero can index everything from books and articles to web pages, films and statues. Items saved in Zotero can be assigned tags, and the tool contains search functionality. Items can also have notes, links and files attached to them. From the console, Zoltero users can create collaborative groups with shared libraries, making it possible to share research sources and material. 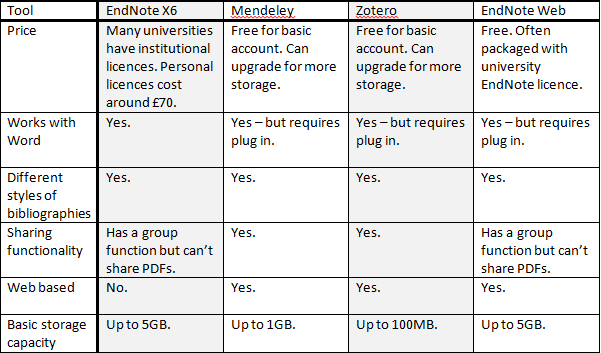 Each Zotero user is allocated 100MB of storage, and there are a range of options to upgrade: 1GB storage costs $20 per year, and 5GB costs $60. EndNote costs around £70 per year, allowing you 5GB storage. While Mendeley, Zotero and EndNote are the common favourites, we would love to hear from readers who use other systems like Delicious, Diigo, Coontea, CiteULike, or BibSonomy. What works best for you? Ellie is an academic researcher at the LSE Public Policy Group. Before joining the PPG, Ellie worked at the University of Manchester as a Research Assistant, and in the media as a freelance reporter. Her interests include network analysis, politicisation processes and social influence. Thanks, this is a really useful view of the different tools. You mention quite a few different ones, but not Refworks, which is the main tool supported here at the OU Library. Have you used Refworks and do you have a view on how it stands up to the others you mention? Hi Katherine, thanks for mentioning Refworks. I’m not very familiar with it, but it would be great to hear more from you about how it works. (2) Since last year Zotero has supported Chrome and Safari as well as Firefox, and can be run as a standalone application in addition to its original form as a Firefox plug-in. (3) Zotero supports WebDAV storage, so you can use a third-party storage service to store your files. The reference database still resides at Zotero.org, but 100Mb goes a long way if the PDF’s and so on are elsewhere. (I use 4shared.com which gives 15GB free, but there are many others). (4) Zotero is an open-source project developed primarily by humanities and social science researchers at GMU. That means it has a bit of bias towards such fields (no harm in the face of the preponderance of everything else that favours the “natural” sciences), and that there are a lot of add-on’s and an active developer community. Among the add-on’s are a number of iPhone and Android applications for accessing your research library from a mobile device and for adding items by scanning ISBN barcodes (http://www.zotero.org/support/mobile#android_apps). Equally importantly no-one’s collecting “big data” about your use of the program! (5) I think the “… but requires a plug-in” comment about Mendeley and Zotero is misleading. Endnote actually uses a plug-in too – there’s no other way to implement integration with Word. And in fact the phrase “Cite While You Write” is copyrighted by Endnote (Thomson), rather than being a feature of Word. The integration, while different in detail. is pretty much the same in functionality and usability in all three cases. Endnote adds a menu and a tab under “References”; Mendeley adds a tab under “References”; and Zotero’s citation commands appear under “Add-Ins”. Word does have its own “Citations & Bibliography” function, which I guess is not a plug-in, but nobody regards it as a serious research manager AFAIK. What about Papers? Attractively designed, integrated repository searching (inc Google Scholar), works with any word processor. Good review, but I too was surprised by the omission of RefWorks. I use that, and like it; it has the advantage of being free if your institution subscribes to it. I think there are tools to use it offline, although I always use it online, since I do my work on a home desktop, a personal laptop, and university PCs so I like the fact that my references are available wherever I am. I’m a very cloud-based user – everything I’m working on is on Google Drive, which syncs with all my PCs. The downside, of course, is that if you have a slow connection or no Internet available when you’re at a conference, say, then you don’t have instant access to your references. 1. Links to various databases (eg COPAC, British Library and lots of university library catalogues) so I can usually just import my reference instead of having to type all the details in manually. 2. Easy to edit output styles – our department uses Chicago with a few modifications, such as names appearing as JR Smith instead of Smith, J. R. – and that’s easy to do in RefWorks. The data is stored just once (of course) but the references can be displayed in all sorts of formats, including your custom ones. 3. Easy to search and group references (e.g. I have a “need to read these” folder, and although each reference only exists once, it can be in multiple folders. 4. Has a “Write and Cite” tool for Word, so it’s easy to insert references in a Word document direct from your RefWorks database – and you can generate a bibliography (in whatever style you want) easily too. 2. No easy way of using a short form for subsequent references. For instance, the first time I mention a reference I want to cite it in a footnote in full – e.g. “After the Plague – an analysis of English village communities after the Black Death, JP Smith, (Bristol: Acme Press, 2011) p.18” but it would be nice to include “hereafter called ‘After the Plague'” so the second reference would just say “After the Plague, p.58”. Can’t do that in RefWorks as far as I can see. Thanks for nice comparison. I use Mendeley for reference management and MS Word for making document. I have written a blog on Mendeley http://knowyourstuff.in/best-free-reference-manager-for-ms-word and a video showing features of Mendeley https://www.youtube.com/watch?v=xNVIJc8Fco8. You may include it in your blog as reference if you find it useful and feel that readers might get benefited.